Enjoy the delightful world of embroidery and learn how to create small, free-form embroidery pieces that are alive with color and texture. 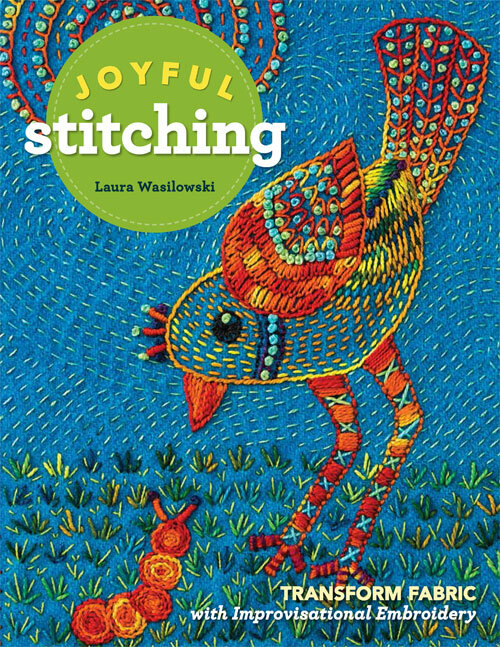 With instructions for 21 embroidery stitches and 6 projects, all in Laura’s signature colorful, whimsical style, you’ll transform a flat, plain surface into a joyful, design-packed art piece. Stitch on wool, felt, or silk, and enjoy the simple pleasure of slow stitching. Includes a gallery of artwork and display ideas. See a preview of the 6 projects here. See Fabric and Thread Stitch Kits for the projects here. Enjoy the ease of hand embroidery on wool and create these 5 small, free-form embroidery pieces. Your free-form embroidery begins with simple shapes transferred to the wool. Shapes are outlined with linear stitches then filled in with a bounty of hand embroidery stitches. Step-by-step directions guide you through the 5 stitch projects. Chapters include the types of fabric, thread, and needles to use; how to transfer the patterns for each project to the wool; and embroidery stitch diagrams. Plus you’ll find a bonus project: how to make an etui or small sewing kit. Illustrated with colorful details, this book is ideal for those who want to explore the world of free-form embroidery and stitch just for the pleasure of it. See a preview of the 5 projects here. Enjoy 11 fused applique projects featuring houses like a gardener’s cottage (cover), houseboat, lighthouse, and even a windmill! You are given patterns for each design and shown an easy pattern transfer process for fused fabrics. A chapter is devoted to hand embroidery for fused art quilts. A great way to bring your little quilt to life! Each project has a list of suggested hand embroidery stitches and there are embroidery stitch diagrams to show how to make the stitches. A final chapter shows the wrapped binding that give these quilts their wonderful curved finish. See a preview of the 11 projects here. Sorry, this book is sold out. Please visit C&T Publishing for a print on demand or ebook version of the book. 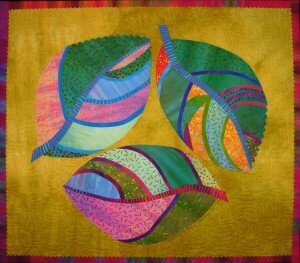 Learn fusing tricks of the trade and create this beautiful leaf quilt at the same time. The Leaves in a Whirl package includes complete instructions, pattern, and a DVD showing you the fast construction process step-by-step. 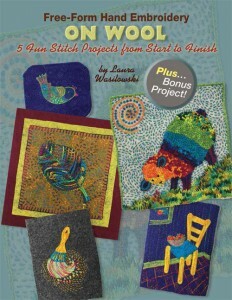 Like taking a class with Laura, learn quick pattern transfer, bias fusing, and the value of hand-embroidered textures. See variations of this leaf pattern that you can adapt to your own designs. It’s a delightfully easy project! View details of the project here. Now on sale for $13. Create your own story in cloth. 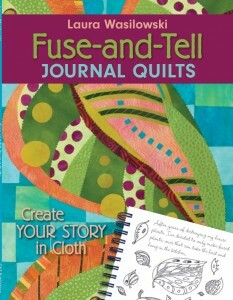 Transform your musings, doodles, and snapshots into these small, fun-to-make journal quilts. There are 6 complete projects plus bonus materials to make your own one-of-a kind art quilts. Learn new fusible techniques like bias fusing, cheesecloth fusing, fused trapunto, and the wrapped binding using Timtex or Fast2fuse. 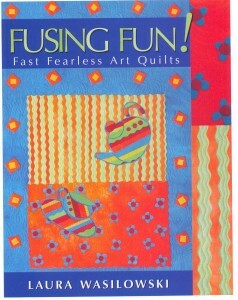 Make fun, fast art quilts with fusible web. 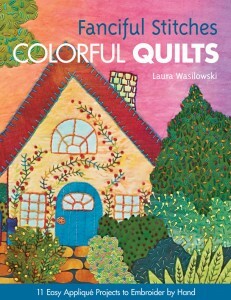 This book is great for learning all the basics of creating fused art quilts from start to finish. Projects range from simple to complex and pictorial to abstract. There are variations on each project, several binding and display techniques, and a gallery of artwork by other fusing artists. Be inspired to make your own artwork by learning the fine art of fusing. View the 7 quilt projects, an excerpt and reviews from Fusing Fun here.